Instructional Sheet Insert - Flottman Company. Our customer sells their products all over the world and needed a way to share use and safety instructions with everyone who buys their products. Create a miniature folded insert to allow more room for information. 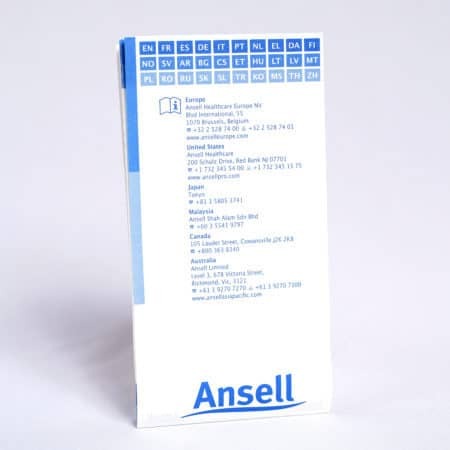 The 32-panel instructional sheet insert includes information in 30 languages so all of our customer’s consumers can use their products effectively. Flottman Company is known for our success with miniature folded inserts. This project is a great example of the versatility miniature folding provides. Our customer needed to include instructions with their safety gloves and sleeves products. The problem? They sell their products worldwide and needed to include instructions in 30 different languages. Instead of creating a bulky booklet that included all languages, or separate sheets for each language that would need to be packaged separately, they chose to use a miniature folded package insert. By using a miniature folded insert, they were able to include all information in every necessary language on one sheet. The 32-panel 13.375″ by 27.5626″ sheet folds down to 3.5625″ by 6.75″. The thin folded piece fits in easily with the product in its packaging. Each panel is dedicated to a different language, along with a cover and back page. By placing each language on a separate, clearly-labeled panel, consumers can easily find their preferred language. This job was printed using a PMS color that is used in this company’s branding. Our quality team ensures that Pantone colors match the book, so this insert fits in seamlessly with all other aspects of the company’s branding. This job was also produced entirely in house, including trimming, printing and folding. By offering both printing and folding services, we are able to provide cost savings and quick turn-around times for all of our customers. Do you have bulky instruction sheets for your products? Let Flottman Company tell you how miniature folding can help your company! Request a quote today!